I rarely have breakfast with friends. Meets are not scheduled early in the morning so that takes a huge chunk of the reason. While I have seen Jake wake up and have his first meal of the day with me around, I myself am not having a meal. It’s well-known that I don’t so sleepovers—that is until Saturday night. Why? Because Jake and I had planned to go on a breakfast buffet in the south, it made more sense that both of us start at his place than separately because it would cut the time in half and thereby increasing the chances that we’d get a good seat. During my stay at their house, Jake had a Spotify playlist on, which he listened to while he worked. While I loved the songs, it made me sleepy. That’s not a criticism to the songs—I was just tired from the day’s activities. Fast forward to the morning after: both of us got up at 4AM and had our first breakfast: leftover roasted chicken. 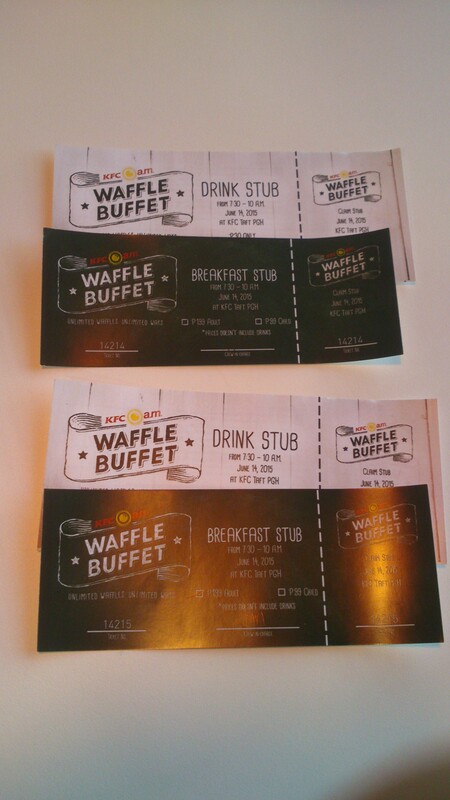 We harried ourselves to get to the Kentucky Fried Chicken (KFC) Waffle Buffet. 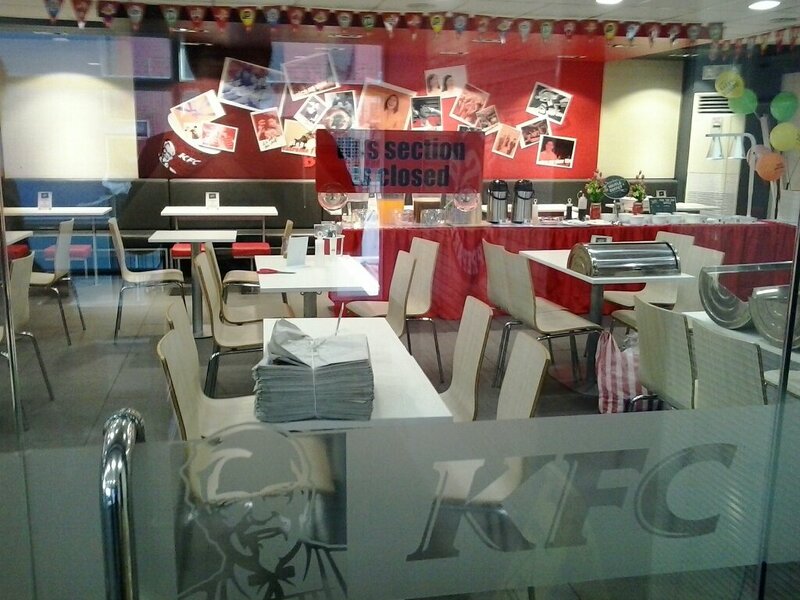 Our branch of choice: KFC Taft-PGH. Php 199 for adults, Php 99 for kids. It’s only available during weekends from June 13-July 5. Read more here to learn where it’s available. We waited for an hour and a half. Then, the madness began. There wasn’t that many when the buffet started. Yet we couldn’t help but race to get to the line first. How predictably competitive! The newly launched chicken and pecan pies along with the fried rice were self-served but the scrambled eggs, chicken hotdogs, chicken tocino, and chicken fillets were handed out by staff dressed in checkered red and white jumpsuits. I did not have the sensibility to get a photo of them because of hunger. But I was able to capture shots of the waffle station. The rest of the table. My first round had the following: unbelievably creamy scrambled eggs, savory chicken tocino, fully-packed chicken hotdog, and dry chicken fillet—all paired with fried rice. I did not know that the gravy was just near the servers so I never had any, which was a bit saddening. On my other plate, there was waffle topped with mango sauce, strawberry sauce, and peanuts along with chicken and pecan pies. Jake’s difference with mine was the missing rice and tamer choice of toppings. He had coffee, I had hot chocolate. On our second round, because I had filled myself with so much rice, I ate the ones that I loved most: chicken tocino drizzled with the fruitiness of mango and strawberry and dashed with peanuts. Jake replicated my experiment on three of his pieces. We agreed that tocino with mangoes work, not so much with strawberries, and peanuts were just for texture. 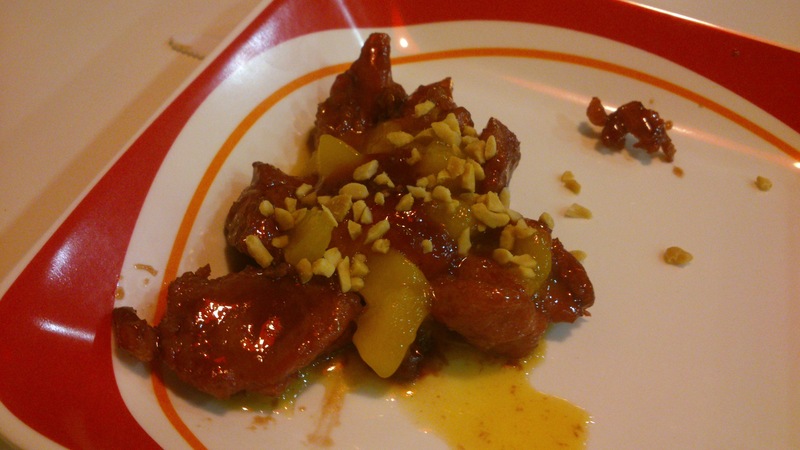 Experiment: chicken tocino drizzled with mango bits and strawberry sauce topped with peanuts. For the record: this is a first. Besides the sleepover, that was our first breakfast buffet. We’ve had lunch and dinner buffets before. Being ridiculously full so early in the morning was familiar and strange at the same time. Done with our second breakfast, we swung by Sta. Ana Church then on to SM Megamall where we had Hattendo Japanese Chilled Cream Buns. Jake chose Matcha, I the Chestnut. Both were true to their inspiration for taste and were unsurprisingly subtle and so appealing but what won us over was how the kiosk staff was so accommodating. They love bowing to customers who were familiar with Japanese customs, like Jake. For the record, the buns weren’t our only dessert. Because we were eating at the Mega Food Hall, we also had Dojo Japanese Ice Cream. The two ladies who manned the station invited us to taste every ice cream they had available. They had almost everything they offered, save for Melon and Lemon. Jake had the Miso Sake, I the Strawberry Banana. Jake’s possessed a surprising cheesy quality while mine was reminiscent of baby food—but in a good way! We paired them with the buns, which made for an interesting second dessert. I like getting lost in bookstores, taking the train on Sunday mornings and holidays, and weirding out friends especially when it comes to food. Mati Serraño on Super Food at a Super Café? Monch Weller on Super Food at a Super Café?